Don’t wash your dirty laundry in public is part of the art work I produced at ‘Bodies: a group residency by Synecdoche’ . It’s based around a series of temporary installations of used clothing that I made between 1st and 29th September 2016 in The Unit, an empty shop in a busy shopping area in the centre of Bristol, UK. The space was open to the public for 4 days a week. It took on a life of its own and became part performance, part social engagement but was also participatory, confessional, interactive, and conceptual. Have a look at the presentation I have made about Don't wash your dirty laundry in public; it captures just a snapshot of the whole. Since then I have had another busy month, exhibiting at Unravelling and catching up with everything I’ve neglected. Now, finally, I have time to give more thought to what happened at Bodies so that I can see how to develop these ideas further. I have recently been asked to do a presentation about my work and it has set me thinking again about why I use zips in my work and how I ended up sculpting what many people see as giant genitalia! I also realised that, although I have addressed these questions thoroughly over the past couple of years, I haven’t explained myself publicly. So I’ve reworked a piece that I wrote almost exactly a year ago, in response to the reactions of the public to my work at The Knitting and Stitching Show at Alexandra Palace, London. I clearly felt I needed to explain this aspect of my work at the time as I wrote it for my press pack for the Harrogate show, four weeks later! I have taken the liberty of editing it, of course, as time changes everything. 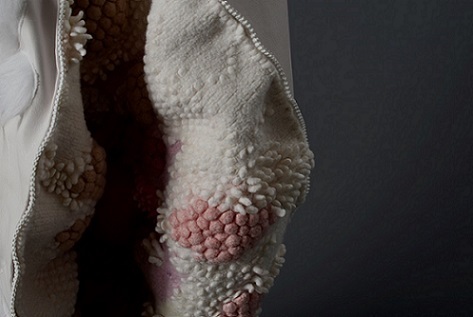 Some of my soft sculptures are on tour again! 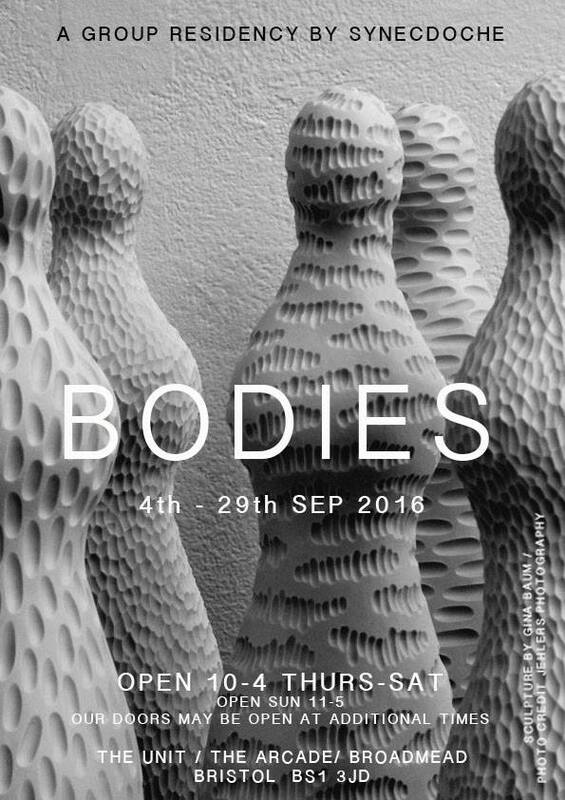 I'm part of the Bodies group residency, 12 artists from Synecdoche Art Community doing a month's residency throughout September in an empty shop, The Unit, in The Arcade in Broadmead, Bristol. I haven’t done anything like this before, so I’m excited to see what will happen. We’ve already started and we’ve set up a studio/testing/research space to explore ideas based around the body. There will be new work being made, as well as old work being displayed. I've already started work on an installation of the Baker family’s discarded clothes. I'm also giving them away! You will possibly recognise a couple of my soft sculptures on show, and I’m planning to make more while I’m there. The space will change over the month as the work develops and as the group hosts events, collaborations, workshops and seminars. Different combinations of artists will be in residence each day; no two days will be the same. Come and see what we get up to!